Anthem: "National Anthem of the Republic of China"
a. ^ See also Names of China. b. ^ Nanking (now Nanjing) was the seat of the government from 1928 until 1949 except during wars, when the government retreated to Taipei. c. ^ Population and density ranks based on 2008 figures. 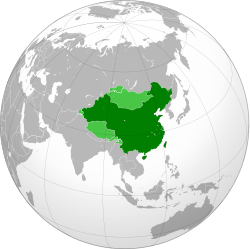 The Republic of China (traditional Chinese: 中華民國; simplified Chinese: 中华民国; pinyin: Zhonghua Minguo), also known as Republic of China (Taiwan), is a democratic island country in East Asia. It is often called Taiwan. The People's Republic of China (PRC) is to the northwest; Japan is to the northeast; the Philippines is to the south. The Chinese Nationalists lost the Chinese Civil War to the Communists in 1949, and moved the government of the Republic of China from Nanjing to Taipei. It still claims the ownership of all of China including Mainland China. The Pescadores (Penghu, 澎湖列島): They also are part of Taiwan Province. Quemoy (Kinmen, 金門): A part of Fujian province, called Kinmen County(金門縣). Diaoyutai Islands:The Diaoyutai Islands (釣魚臺列嶼|Diàoyútái Lièyû) are a group of islands where nobody lives that the Republic of China (ROC) claims it belong to them, but also claimed by the People's Republic of China (PRC) and Japan. In Japanese, the islands are known as the Senkaku Islands (尖閣諸島, Senkaku Shotō?). The islands are now under the control of Japan. Dong-Sha Islands:The Pratas Islands or Dong-Sha Islands (東沙羣島) consists of three islands in the northeastern South China Sea, 340 km southeast of Hong Kong. Taiping (Traditional Chinese: 太平島|Tàipíng), also known as Itu Aba, is the largest of the Nansha Islands (Spratly Islands) in the South China Sea. The ROC used to govern Mainland China too. Now Mainland China is governed by the Communist People's Republic of China; see History and Political problems of China. However, ROC still declares Mainland China as its territory officially. The Republic of China also used to govern Mongolia. This is the territory of the Republic of China between 1912 and 1949. There are administrative divisions in different levels and types. 157 Districts (區 qū), 17 Country-controlled cities (縣轄市 xiànxiáshì), 41 Urban Townships (鎮 zhèn), and 153 Rural Townships (鄉 xiāng) stand the 3rd level. Districts stand under either Special municipalities or Provincial cities; Country-controlled cities, Urban Townships, and Rural Townships stand under Counties. Villages (里 lǐ or 村 cūn) stand the 4th level, and Neighborhoods (鄰 lín) stand the 5th level. The Nationalists, led by Dr. Sun Yat-sen, got rid of the Qing Dynasty ruled by the Manchus, then they established the ROC and ended Imperial Dynastic Rule in late-1911. The ROC at that time had Mainland China and all of what is now called Mongolia. After the Japanese were defeated by the Allies during World War II, Taiwan was controlled by the ROC. In 1949, the Chinese Communists fought a war against the Nationalists and won. They established the People's Republic of China. The Nationalists left mainland China and arrived in Taiwan. After the ROC created a base on Taiwan, it hoped one day to capture the Mainland. But Chinese Communists grew stronger, so the Nationalists never did go back. The Communists say they replaced the ROC as the only government of China and also calls Taiwan their own. There are those people in Taiwan who want to never be a part of the People's Republic of China. They believe in complete Taiwan independence and want to rename the ROC (Taiwan) to "Republic of Taiwan" so Taiwan can no longer have any ancestral connection to China or Chinese culture. Some other people wish to unite with the People's Republic of China; they want Chinese reunification. Some still want to attack the PRC and reunify China under the Republic of China. Some others want the status quo, which means keeping everything the way it is now. Most Taiwanese people speak the Standard Chinese language known as Mandarin, and others speak local dialects such as Min Nan (Taiwanese) or Hakka. The Cantonese language, spoken in parts of southern China (for example, the province of Guangdong, Hong Kong and Macau), is not spoken in Taiwan. A small percentage of Aboriginal Taiwanese speak aboriginal languages, but the rest of the Chinese people have treated them badly, and many of these people, and their languages, struggle to survive. Some older Taiwanese people who went to school while the country was under Japanese rule can speak Japanese. After the Nationalist government fled the Mainland in 1948-49, they brought their language, Mandarin, with them, and made Mandarin the only official language. Then everyone in the ROC had to learn Mandarin. But, unlike the people in Mainland China, the Taiwanese never changed to simplified Chinese characters and so they have always used traditional Chinese characters. In the past, students were not allowed to speak their mother tongue in school and were expected to speak only Mandarin. Taiwanese, Hakka, and native languages were considered bad until the early 1990s, when education in these languages began to be taught in some school systems. They were promoted, but by this time, many young people could speak only Mandarin. ↑ Waishengren usually refers to people who immigrated from mainland China to Taiwan after 1945, also the Chinese refugees migrated to Taiwan due to the Chinese Civil War, and to their descendants born in Taiwan. It does not include citizens of the People's Republic of China who more recently moved to Taiwan. 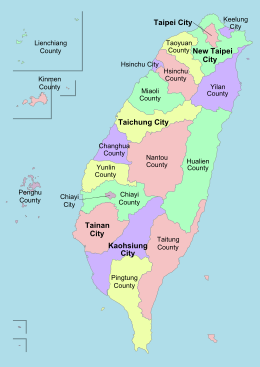 ↑ "Taiwan (self-governing island, Asia)". Britannica Online Encyclopedia. 1975-04-05. Retrieved 2009-05-07. ↑ "The Republic of China Yearbook 2009. Chapter 2 – People and Language". Government Information Office. 2009. Archived from the original on 3 August 2010. Retrieved 2 May 2010. ↑ "The ROC's Humanitarian Relief Program for Afghan Refugees". Gio.gov.tw. 2001-12-11. Archived from the original on December 15, 2004. Retrieved 2009-05-07. ↑ "Taiwanese health official invited to observe bird-flu conference". Gio.gov.tw. 2005-11-11. Retrieved 2009-05-07. ↑ "Demonyms – Names of Nationalities". Geography.about.com. Retrieved 2009-05-07. ↑ Although the territories controlled by the ROC imply that the demonym is "Taiwanese", some consider that it is "Chinese" due to the claims of the ROC over all of China. Taiwanese people have various opinions regarding their own national identity. ↑ "Office of the President, Republic of China". Retrieved 17 December 2016. ↑ "MOI Statistical Information Service". Retrieved 2011-06-22. ↑ 11.0 11.1 11.2 11.3 "Republic of China (Taiwan)". International Monetary Fund. Retrieved 2011-09-20. ↑ Regularly check CIA factbook or Household Income distribution of major countries. http://eng.stat.gov.tw/public/data/dgbas03/bs4/ninews_e/9808/t14e.xls. ↑ Due to its political status, the UN has not calculated an HDI for the ROC. The ROC government calculated its HDI for 2010 to be 0.868, and would rank 18th among countries. ↑ "ICANN Board Meeting Minutes". ICANN. 25 June 2010. ↑ "GEOFON Program GFZ Potsdam :: Earthquake Bulletin". geofon.gfz-potsdam.de. This page was last changed on 11 February 2019, at 17:58.